Right now I'm in Las Vegas for this year's edition of the Superstars Writing Seminar where I'm an instructor. I posted about this several times over the last few months, so I hope it's not a surprise to anyone! Hal-Con in Halifax, Nova Scotia has been added to my events calendar for October this year. I'm looking forward to meeting lots of Canadian readers! That should be my final convention for 2012, and then will come the book tour in January, which is in the planning stages. For my current schedule as it stands, see the previous link. The most recent Writing Excuses podcast episode is another one that was recorded in front of a live audience at Life, the Universe & Everything. It features James A. Owen talking with Dan, Mary, Howard, and me about discovering your voice. This week's ALCATRAZ VERSUS THE EVIL LIBRARIANS annotation covers one of my favorite chapters, number eleven. It's the one where Alcatraz talks about how authors like to torture people. But that's not what makes it one of my favorites. Also, in case anyone missed it last week when I mentioned it on Twitter and Facebook, Tor.com has put up the excerpt of the prologue to A MEMORY OF LIGHT that Harriet read recently at JordanCon. As for the rest of the book, we are still hard at work on revisions. My former student Scott Ashton posted another of my class lectures. This one is about characterization. There's also an email group for people who want to recreate the entire class experience online. Hey, all! This weekend is the Avacyn Restored prerelease, and as with the previous two sets, Dan and I are going to head up to Epic Puzzles & Games for their midnight release party. We're hoping you are all interested in playing with us again, because as long as we have a small crowd, Epic will rent us our own room to play in again. We won't be participating in the Helvault promotion, as that is a closed thing that only a certain number of people can join. (And I'm sure it's full already.) As is normal for us, we're kind of deciding this at the last minute. But it will still be fun. We'll probably do a kind of two-headed giant format as we did last time, so feel free to bring a friend! We'll have our own tournament, with prizes. And, like last time, if you beat Dan and me you will be able to steal cards out of our decks. Sweet, eh? Details are below. If you want to be guaranteed a spot, please call Epic Puzzles & Games and sign up, leaving your phone number. This will also let us know how many people we're going to have ahead of time. (We'll want at least sixteen, which is about what we've been getting at these things.) Also, note that it will probably be one of your last chances to see Dan before he moves away to Germany for a year. Just a quick note that my good friend and Writing Excuses cohost Mary Robinette Kowal will be appearing tonight in Salt Lake at Weller Book Works. This is Sam Weller's new store in Trolley Square, where there's actually parking unlike at their old location. Go see her and get your copy of GLAMOUR AND GLASS signed! In this week's Writing Excuses podcast episode, Larry Correia joins Mary, Howard, Dan, and me in front of a live audience at Life, the Universe & Everything to talk about guns in fiction. If you don't know much about guns and want to use them in your writing, give it a listen. While I was in Australia, I did an interview for ABC Radio. You can find it here. My assistant has also uploaded a new Twitter posts archive. The most recent ALCATRAZ VERSUS THE EVIL LIBRARIANS annotation covers chapter ten, where I torture the reader some more by interrupting cliffhangers. One of my students has started releasing my creative writing class lectures from this year online. Eventually you'll be able to find them all on this page. The official schedule lists my panel topics as "Wheel of Time" on Saturday and "Warbreaker!" on Sunday. Since I'm the only one on each panel, I will probably switch things up and do a reading, Q&A, or something else. See you there! Note that JordanCon in Atlanta is also this weekend, and I'm unfortunately not attending due to being on the wrong continent. But I'm sending my assistant Peter in my place, and all of Team Jordan will be there, as well as Author Guest of Honor Mary Robinette Kowal and Artist Guest of Honor Sam Weber, among other luminaries. You can see their schedules here. And a reminder that I will be in Las Vegas for the Superstars Writing Seminar on April 30th through May 2nd. You can see all of my upcoming events on my events page. This week's Writing Excuses continues our discussion of Mary Robinette Kowal's outline of a middle-grade novel she planned back in 2003. At twenty-five minutes it's a lot longer than our typical episode, but if you're wondering about outlining, a listen will be worth your while. My assistant has put up another of my annotations for ALCATRAZ VERSUS THE EVIL LIBRARIANS. This one covers chapter nine, when the talking dinosaurs show up. He also put up another Twitter posts collection. If you're in Sydney and aren't following me on Twitter or Facebook, you missed my announcement about a Tuesday night Magic draft at my hotel. Should be fun. A reminder that I'll be signing in Sydney on Wednesday night. Details are below. I'll also be in Gold Coast for Supanova this weekend; I'll post my schedule later this week. Notes: Event organized by Dymocks North Sydney. Includes a talk, reading, and Q&A. There is a $20 entry fee; call Dymocks at the number above for more details. Now, you may ask what the panel topic is on both days. It looks like each will be a solo panel, so I may do a reading, Q&A, or something else. See you there! And a reminder that I will be in Sydney and Gold Coast next week. You can get details on my events page. 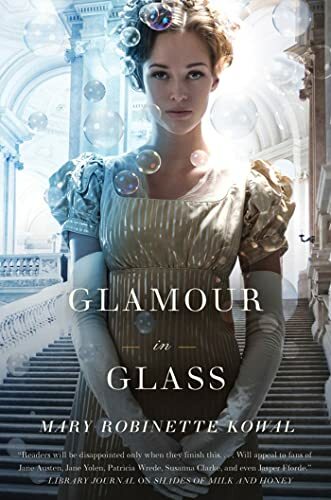 Today marks the release of Writing Excuses cohost Mary Robinette Kowal's novel GLAMOUR IN GLASS, which you should read. On this week's podcast episode, Mary offers up an outline from 2003 (of a middle-grade fantasy Mary was planning) for us to dissect, and it's an educational process. The most recent ALCATRAZ VERSUS THE EVIL LIBRARIANS annotation covers chapter eight. It explains why elevators are more primitive than stairs, and talks about the hidden continents that the Librarians don't want you to know about. In the Suvudu Cage Match, you voted Moiraine into the final match, against Kylar Stern from Brent Weeks' Night Angel trilogy. If you're interested, vote for who you think would win. I'll be hanging out on Google+ from the Google offices in Sydney, Australia on Wednesday, April 18th at 1:00 p.m. Australian EST. (In US Eastern Time, that's 11:00 p.m. on April 17th.) If you would like to join the Hangout, post a question in the comments of this post on Google+ and let me know what you'd like to hear about in the Hangout. The best questions win a place in the Hangout, with preference going to my Australian readers. Don’t worry if you miss out—this will be a Hangout on Air, which means you can tune in to watch the discussion. Make sure you’ve added me to a circle, and then watch your stream starting just before 1:00 p.m. on April 18th for details. Just a quick update for today. I'm currently flying to Australia. Yesterday's Writing Excuses episode is all about writing excuses—all those handy tricks that the great authors use to prevent themselves from finishing any book before its time. There are a couple of quotes from me in an article on CNN's Geek Out about media adaptations of fantasy. The most recent ALCATRAZ VERSUS THE EVIL LIBRARIANS annotation covers chapter seven. I discuss crossbreeding Summa Theologica with Little Women, and Alcatraz making a girl's shirt fall off.